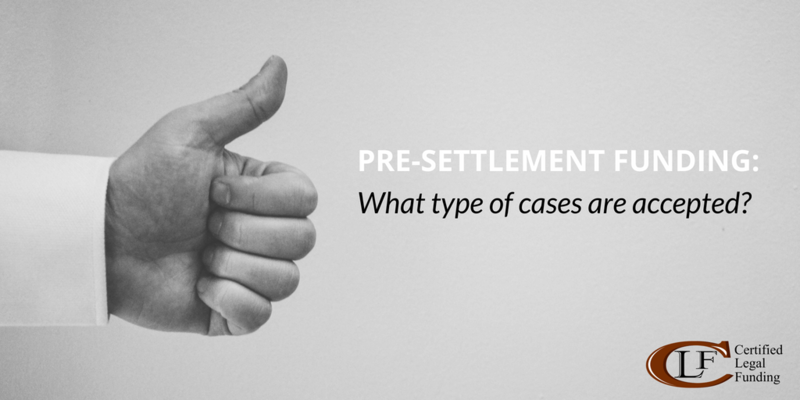 Pre-Settlement Funding: What Type of Cases Are Accepted? 15 Jun Pre-Settlement Funding: What Type of Cases Are Accepted? If you are interested in getting a cash advance on your settlement, you will want to first understand what types of cases qualify for this type of loan. To qualify for pre-settlement funding, you have to be a plaintiff in a personal injury case. You must also have been injured due to someone’s negligence. Pre-settlement funding is an option available to those who lack the ability to financially support themselves during the lawsuit. A lot of injured plaintiffs are unable to return to work quickly because of their injury, which means their income will stop coming in. Add in the fact that medical costs can become quite substantial, then it is easy to see why many plaintiffs settle for far less than they should. But, with the pre-settlement funding, you don’t have to anymore. This option gives you the ability to keep your lawsuit going so that you may receive the amount that you are seeking out. So, what types of cases will be accepted? Does your case involve you becoming injured due to someone’s negligence? If the answer is yes, then you most likely qualify to receive pre-settlement funding. Whether the case involved a car accident, a slip, and fall, or getting injured while on the job, pre-settlement funding is there for you. But, these cases of negligence don’t automatically qualify you for a pre-settlement cash advance. The first step towards that is to have your attorney approve the funding. Once they approve of it, then you can send in your application to a legal funding company for approval. When you are approved, you will receive your money shortly. Pre-settlement funding is actually just a cash advance. The legal funding company will give you a cash advance if they are confident that your case will either settle or that you will win. They then give you a portion of your future winnings upfront so that you can have it now. When you win, you repay the legal funding company the amount they gave you, plus interest and fees. If you lose the case, then you pay them nothing. Unlike regular bank loans, these cash advances don’t come with all those strings attached. A regular loan requires you pay it back, win or lose. Pre-settlement funding also doesn’t require a credit check. Now is the time to secure your financial future while you await your settlement. Don’t settle for anything less than the amount you deserve. Make sure you receive the money that should be awarded to you by calling us at 1-800-922-7439 today. We are available 24/7 because we know the world doesn’t stop for anybody. So, let CLF have your back with pre-settlement funding.